Raya won due to efforts to expand and to lead the Financial Solutions market in Egypt with sales exceeding 256% compared to its annual planned target. 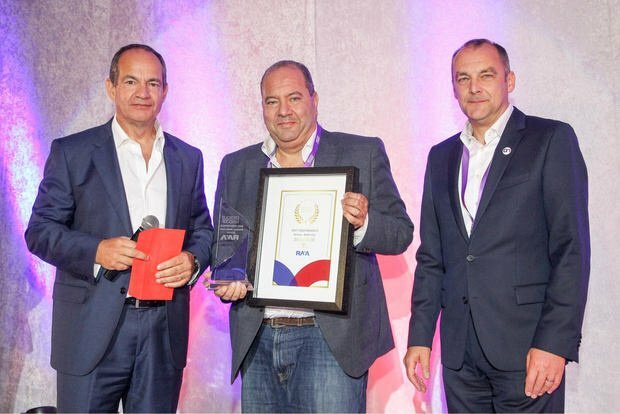 Raya Information Technology, the leading system integrator in the Egyptian market, has won the award of theBest Performance Partner of the Year in Middle East and Africa from Wincor Nixdorf after a tough competition between 85 Wincor Nixdorf partners from 72 countries around the world. The award was announced in Wincor Nixdorf annual conference for MEA regionthat was held from 09-12 May, 2017 in Cape Town, South Africa the Middle East and Africa. Raya Information Technology received this prestigious award as a result of its continuous efforts to expand and to lead the market of the Financial Solutions in Egypt with sales exceeding 256% compared to its annual planned target. Raya has always been keen on offering state-of-the-art solutions not only in theATM andSelf-Services but also the Value Added Multi-Vendor Applications and Person -to- Person-Cash transferwhich enables the banking sector to conduct financial transactions through advanced ATM machines that outperform competition in its category. Raya Information Technology is apartner of Wincor Nixdorf as part of a partnership that extended formore than 20 years of cooperation in the Egyptian market. Hisham added “Raya Financial Services Team masters a wide range of extended Financial Solutions such as Forex and cash wallets, Money Remittance Solutionsin addition toPROVIEW which is considered as the highest market share & proven technology worldwide due to its distinctive unique features in terms of Management and monitoring systemthat are not offered in similar competing solutions.In line withRaya’s continuous efforts to provide its customers with the latest branch automation technologies; our solutions portfolio dynamically grows day over day to cover the new technology advancement and the foreseen market demand. Hisham highlighted thatRaya Information Technology adopts the government initiative of the Financial Inclusion and E-Payment to achieve financial stability and economic growth. In this frame, Raya helpsits banking customers to implement the latest solutions/ services needed to apply this initiative. Hisham stated “one of our major offerings in this area is the 24/7 Onboarding Services which facilitates the opening of bank accounts for new clients through the Multifunction Kiosks in an easy and fast way that does not take more than 7 minutes per user.